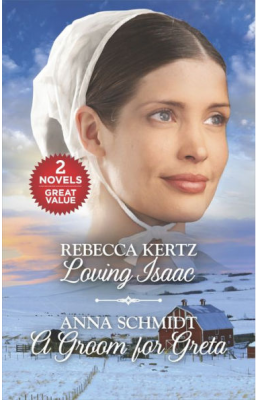 Everyone in their small Amish community expects Greta Goodloe to marry her longtime sweetheart — Greta included. So when he publicly ends their engagement, in front of newcomer Luke Starns no less, she is utterly humiliated. At least she can take comfort in matchmaking between Luke and her quiet schoolmarm sister. Yet the more she tries to throw them together, the more Luke fascinates her. A serious, no-nonsense schoolmarm should be exactly what Luke wants in a wife. Still, he can’t help but be charmed by Greta’s warm smile and impulsive ways. Does he dare to stray from the sensible choice and take a chance on happiness? A GROOM FOR GRETA (4) by Anna Schmidt: At 22, Greta Goodloe has been planning to marry Josef for the past five years, when he unexpectedly announces he will not marry her. Knowing that blacksmith Luke Starns overheard Josef’s declaration, she confronts him and finds herself agreeing to help him court her older sister, Lydia. Though Luke believes Lydia is the best choice for a wife, it’s Greta that he’s attracted to, something Lydia points out. With her help, he and Greta are soon planning their future, but Luke’s past threatens to destroy their happiness. This third entry in the Amish Brides of Celery Field series is a fine tale with characters who are delightfully complex, and flashes of humor add lightness to the story.